through the integrated ¾” flush and fill ports. The means of hydraulically isolating the outdoor heat pump unit from the rest of the heating system is a task which should only be left to the highest quality isolation valves. SOLFEX full bore lever arm isolation valves ensure the absolute minimum resistance when open, and a secure leak free confidence when closed. 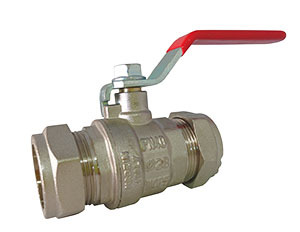 2 port valves perform a very simple function; to deny or allow flow. The beauty of our Spanish made valves is in their design. 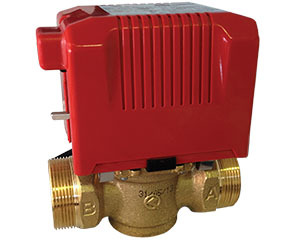 A very simple but effective motorised opening system ensures that unlike many other 2 port valves, these are flexible enough for a wide variety of heat pumps without the worry of unwanted flow related error codes. 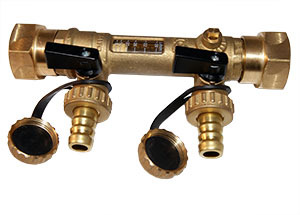 Our Spanish manufactured 3 port diverter valves are specifically manufactured for use with heat pumps. 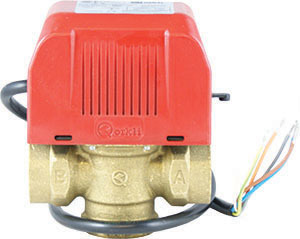 Being a true diverter valve and not a mid position valve, there is no danger of supplying heating in the middle of summer when the hot water cylinder is being satisfied.